Thank you to Eunice Cernohlavek for this November 10, 2016 report and photos from November 4th and 5th. You can click on the photos to see a larger version. 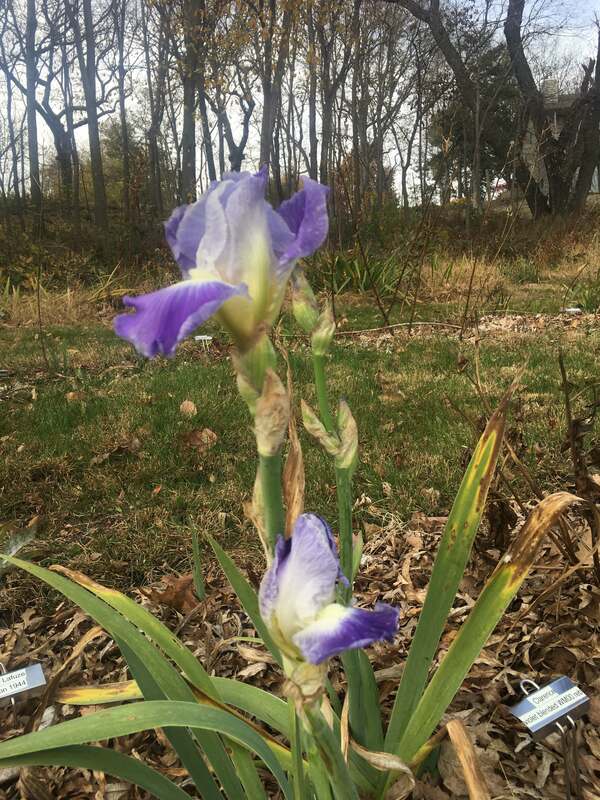 This last week I was taking pictures of reblooming iris at Gary and Linda’s gardens. Here are pictures of two. Two tall bearded varieties really put on quite a show. Daughter of Stars by Donald Spoon 2000 is a rebloomer and received the Award of Merit in 2005 and Wister medal in 2007. It had 1 stalk with 2 blooms, 2 buds and another stalk with 1 bud. The other TB is Aunt Mary, a 2000 introduction by Tim Stanek. It is not a rebloomer, but indicates it’s a late bloom, but this is really late!! It had 3 open blooms, 3 buds, and 6 spent blooms. And Rosalie Figge has a bud stalk showing color as of this week also. Among the other plants blooming in the garden are various clematis, and roses. Do these plants know that winter is coming?